The turnout for a rally on Sunday [March 4, 2018] at the Lincoln Memorial in support of President Donald Trump, which was organized by the leader of the group Gays for Trump, grew from about a dozen people at its 11 a.m. starting time to nearly 100 enthusiastic participants by shortly after noon. As it turned out, all those who spoke on a makeshift stage with two loud speakers expressed strong support for Trump. 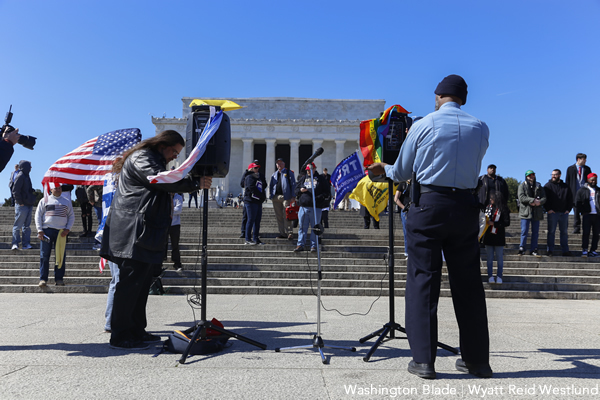 A similar March4Trump rally organized by Boykin one year ago on the grounds of the Washington Monument drew about a dozen counter protesters who denounced Trump and shouted insults at the pro-Trump participants. There were no counter protesters at Sunday’s event.